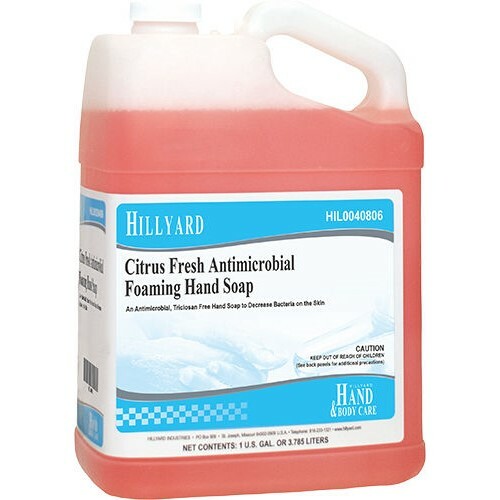 Home → Skin Care → Hillyard, Citrus Fresh Antimicrobial Foaming Hand Soap, Pour in, Triclosan Free, HIL0040806, Four gallon per case, sold as One gallon. Citrus Fresh Antimicrobial Foaming Hand Soap is designed to kill germs on hands and provide a clean, gentle hand washing experience with thick, rich foam. Formulated to help keep hands conditioned during repeated and frequent use. Triclosan free; active ingredient PCMX. Effectively kills germs and bacteria. Leaves hands feeling clean and moisturized. Case Size: 14.5" x 9.5" x 11"